For many of us the measure of success for the trade show is how much swag we take home. Promotional material, giveaways, business cards, brochures … all to be discarded months later after sitting forgotten in a corner of your office. Avoid the tradeshow-bag black hole with QR Codes while showing a little eco-conscious (and budget-minded) style. The largest industry trade shows are typically held first quarter each year, with the Consumer Electronics Show, 2013 International CES LasVegas, starting today. Current statistics indicate that 46% of American adults own smartphones. QR Codes are a natural way for these tech-savvy show attendees to connect with you. It’s your chance to leave a lasting impression — and make it easy for prospective clients, customers and connections to find you again. When used correctly, QR codes are perfect for a trade show or a conference because they help boost traffic to your website, raise brand awareness, and act as a networking facilitator. These handy little tools can have a big impact when it comes to brand visibility and enlarging your reach. As you prepare for your next event, consider incorporating QR codes into your networking and promotion strategies. 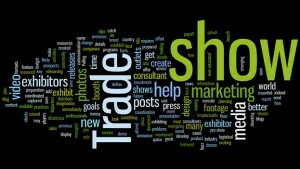 Before you start slapping a QR code on your trade show promotional items, consider your strategy. First order of business: What do you want to accomplish? Once you know that you can decide where the QR code will lead. A landing page designed just for trade show attendees or QR code users? A mobile version of your website? Or elsewhere? Skip the brochures. Take a hint from Sarah Baker of MarketingProfs, “QR codes are a great solution for marketers because your materials will escape the clutter of the trade show bag and make their way into your prospects’ email inboxes. (At the same time) you cut down on the cost of printing and transporting sales sheets.” Don’t send booth visitors away with a stack of paper. Set up a large sign with a QR code they can scan to receive your information via email. Simply create a QR code that triggers an automatic email when it is scanned by a smartphone. The email can contain a pre-formatted message from your company along with links to your sales materials. Skip the business card. A QR code can store your contact information so that scanning it with a smartphone creates an entry in the smartphone’s address book. Stick your personal QR code on your tradeshow name badge (print it on a label), and encourage new business contacts to scan it to ensure your business card doesn’t get lost in the shuffle. It will also help your new contact recognize your name when you make a follow-up call after the tradeshow. Promote your event. If you’re speaking at a trade show or sponsoring an event, ask the show organizers if you can include a QR code in event signage or in the show’s program. That way, you can give attendees an additional way to access more information about you and your company without necessarily connecting in person. Be creative. Promote and tie your QR code to a contest. Let show attendees know that you’re giving away a prize to the lucky someone who scans the QR code. You can set up a promotion-specific landing page to act as the code’s gateway, and by incentivizing the experience, you’ll generate some competition and gather lots of information on the people who stop off at your booth. Don’t limit your offering to just those who visit your booth. You can include your QR code in your tradeshow directory ad, or print it next to your logo on the event signage. This is a particularly effective strategy if you are sponsoring a luncheon table and get to put signage in the centerpiece. You will have a captive audience at the table who might be curious about your QR code. This year’s four-day International Consumer Electronics Show in Las Vegas is just getting started today. We’re as excited as anyone to see what the latest clever innovations for QR Codes will be. If you’re there and see something interesting, drop us a quick note and tell us about it. You can find us on Facebook: [Qr Droid or Zapper Scanner] or simply pop an email to us at social@zapgroup.com.